Put your creativity back in your life. Make it work for you. Follow your Heart! ♦ I have lots of creative ideas but I never get to them. ♦ I’m not creative, but I’d like to be. ♦ I don’t have the time for creativity! ♦ Creativity seems irresponsible to me. ♦ I don’t know where to start. ♦ I procrastinate & then no respect for myself because I just don’t get to it. ♦ I take myself way too seriously. ♦ I just don’t think I’m good enough. Who Can Attend: Anyone and Everyone! 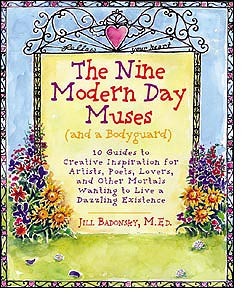 A Muse Group based on the book "The Nine Modern Day Muses (and a Bodyguard): 10 Guides to Creative Inspiration for Artists, Poets, Lovers and Other Mortals Wanting to Live a Dazzling Existence." Patricia Zirin Kronheim is the only Certified Group Facilitator for the runaway bestseller "The Nine Modern Day Muses and a Body Guard" written by Jill Badonsky in the tri-state region. The course will run for 7 weeks. The cost for the course is ordinarily $450. However, this course is being offered on a registration and daily donantion only basis through the month of January/February and each class is limited to 15 people per class, so please call or email early. Journey with the Muses to creative awakening through the rituals, experiences and philosophies of a Muse a week. These classes return mortals to liberated authenticity and help us discover new avenues of creative brilliance (plus they are a LOT of fun!). 30 minute free Individual Coaching Session Bonus if you Register and pay in full by February 1st! IMPORTANT: CONFIDENTIALITY IS NEVER GUARANTEED OVER THE INTERNET. Patricia Zirin, M.F.A,, M.A, Spiritual Psychology U.S.M. About Mind-Blowing Creativity · About Patricia · What is a Muse Group?